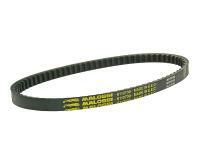 Optimal drive belt for sports to medium-race engines. Softer compoand offers improved grip in colder conditions. Wider design means a higher top speed as the belt can move further outwards. See application list for Minarelli Scooter models that use this belt. MALOSSI is the long-standing industry standard when it comes to after-market racing scooter products. We carry a wide range of performance scooter products from 49cc to 700cc in the Malossi products range. When selecting Malossi try not to mix and match brands know that Malossi components are designed to work with other Malossi components and it will make any upgrades easier to tune since they are designed to work with each other. Malossi is one of our top tier brands with our highest recommendation. 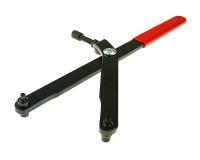 They have an excellent price range, model selection, and the highest quality. All Malossi components are made 100% in Italy. All final manufacturing, assembly, and research and development is done at their facilities in Bologna. Order with confidence this is one of the best brands in the Minarelli 2T Yamaha engine in the Racing Planet range.